-- Dan will assemble just 25 sets of these 20 (!) stereoview cards--15 different images (all 12 of the images in the litho set, plus 3 additional views shot on 9/21) and 5 enlargements of crucial detail. You can see all 20 on the previous page. 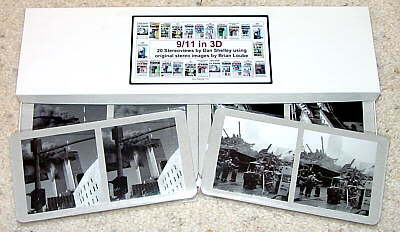 -- Each card back will display a color aerial view of Lower Manhattan taken after the attack, including Ground Zero. Marked on the aerial view is the place where Brian was standing when he took the particular image on that card. Lines draw outward from that point indicate the limits of what can be seen in the view on the front of the card. 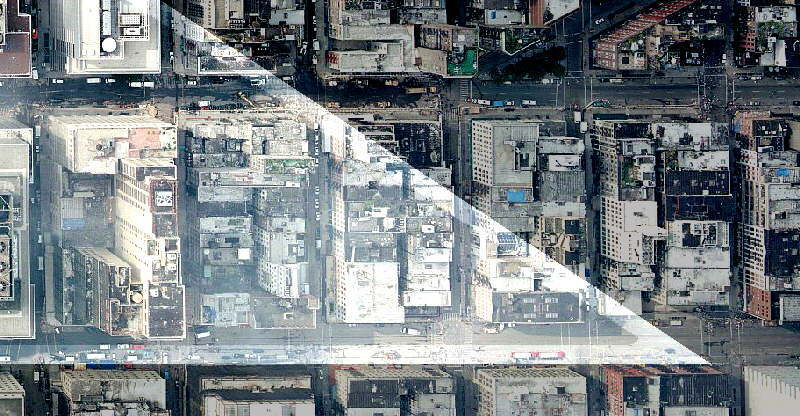 These "view maps" help ENORMOUSLY in orienting you as you look at each image. Close-up of a detail print. -- Edition strictly limited to 25 sets. There are only 7 sets left as of October 3, 2003. Each set comes in a special storage box and is accompanied by a signed and numbered letter from Brian and Dan. This letter will be printed in color with anaglyph copies of severla images on it. A pair of anaglyph red/cyan "glasses" is also included. -- 25% of the sale price of these sets will be donated to The Bowery Mission in New York City at Brian's request. Dan Shelley is hand mounting the 3.5" X 7" stereocards for both the 6 and 20 stereocard editions. When these editions are fully subscribed, no more hand-mounted, archival, numbered stereoview sets will be sold to the public. Total cost per set of 20 views (including postage and insurance) is $400.00 US. -- Send an e-mail to Dan Shelley letting him know that you would like to have him put a set aside for you. -- When Dan acknowledges receipt of your request by e-mail, you will have a week in which to send him your payment in the form of a $400 check or PayPal payment (if you have a confirmed address with them). -- Dan will e-mail you again to verify receipt of your check, and let you know when to expect delivery of your set.